Silverman's Farm, close up of gourds, during the fall. 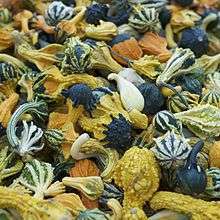 There are many different gourds worldwide. The main plants referred to as gourds include several species from the Cucurbita genus (mostly native to North America, including the Malabar gourd and turban squash), Crescentia cujete (the tree gourd or calabash tree, native to the American tropics) and Lagenaria siceraria (bottle gourd). Other plants with gourd in their name include the luffa gourd (likely domesticated in Asia), which includes several species from the Luffa genus, as well as the wax gourd, snake gourd, teasel gourd, hedgehog gourd, buffalo gourd/coyote gourd. The bitter melon/balsam apple/balsam pear is also sometimes referred to as a gourd. L. siceraria was brought to Europe and the Americas very early in history, being found in Peruvian archaeological sites dating from 13,000 to 11,000 BC and Thailand sites from 11,000 to 6,000 BC. A study of bottle gourd DNA published in 2005 suggests that there are two distinct subspecies of bottle gourds, domesticated independently in Africa and Asia, the latter approximately 4,000 years earlier. The gourds found in the Americas appear to have come from the Asian subspecies, very early in history; a new study now indicates Africa. The archaeological and DNA records show it likely that the gourd was among the first domesticated species, in Asia between 12,000 and 13,000 BP, and possibly the first domesticated plant species. Gourds continued to be used throughout history, in almost every culture throughout the world. European contact in North America found extensive gourd use, including the use of bottle gourds as birdhouses to attract purple martins, which provided bug control for agriculture. 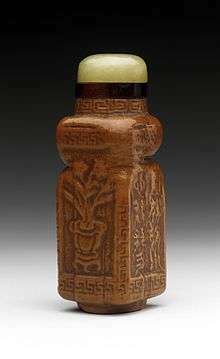 Almost every culture had musical instruments made of gourds, including drums, stringed instruments common to Africa and wind instruments, including the nose flutes of the Pacific. Scientists in India have been working on crossbreeding six members of the bitter gourd genus found in the country to reduce the unpleasant taste while retaining the nutritional and medicinal values of the plants. These include Teasle gourd (Momordica Dioica), Spine gourd (Momordica subangulata), Sweet gourd (Momordica cochinchinensis), balsam apple (Momordica balsamina) and Momordica sahyadrica. An assortment of gourds on a table. ↑ "Cucurbitaceae". Retrieved 24 October 2011. ↑ Paris, H. S. (1989). Historical records, origins, and development of the edible cultivar groups of Cucurbita pepo (Cucurbitaceae). Economic Botany, 43(4), 423-443. ↑ Cutler, Whitaker. 1961. History and distribution of the cultivated cucurbits in the Americas. 1 2 3 Ghillean Prance; Mark Nesbitt, eds. (2012). The Cultural History of Plants. Routledge. pp. 21 & 348. ISBN 1135958106. ↑ Ginger Summit (2001). Gourds in Your Garden: A Guidebook for the Home Gardener. Sterling Publishing Company. pp. 18–19. ISBN 0806926996. ↑ "Scientists solve mystery of World travelling plant", Science, Feb 2014 . ↑ Erickson, David L.; Smith, Bruce D.; Clarke, Andrew C.; Sandweiss, Daniel H.; Tuross, Noreen (2005). "An Asian origin for a 10,000-year-old domesticated plant in the Americas". PNAS. 102 (51): 18315–18320. Bibcode:2005PNAS..10218315E. doi:10.1073/pnas.0509279102. PMC 1311910 . PMID 16352716. ↑ "Bitter gets better". Down To Earth. 2012-09-30. Retrieved 2012-12-21. ↑ Mickey Baskett (2005). Glorious Gourd Decorating. Sterling Publishing Company, Inc. p. 9. ISBN 1402727755. "Gourd". Encyclopædia Britannica (11th ed.). 1911.